When rain falls on Wrigley Field this season and the tarp gets rolled onto the field, Chicago Cubs fans will be treated to a clever marketing surprise. "The combination of an iconic product like Reynolds Wrap and an iconic venue like Wrigley Field makes for a great visual that resonates really well in person, on television and on social media, too," Mike Mazza, marketing director of Reynolds Foil and Cooking, said. An image of the stunt recently captured the attention of over 2 million Reddit users, with one user suggesting the person behind the campaign deserved a huge raise. It's also sparked a handful of satirical comments from witty Reddit users including, "His name is Al … Al U. Minium," and "Reynolds Wrap—foiling Cubs World Series attempts since 1947." "It was really a collaborative effort," Mazza said. "It's tough to give full credit to either party." Chicago Cubs vp of communications and community affairs Julian Green said that the idea for the tarp made perfect sense for the two institutions. When you think about a big rolled up rain tarp, Green noted, it sort of looks like a roll of aluminum foil—and the process of unrolling the tarp on the field looks similar to rolling out a sheet of foil in the kitchen. 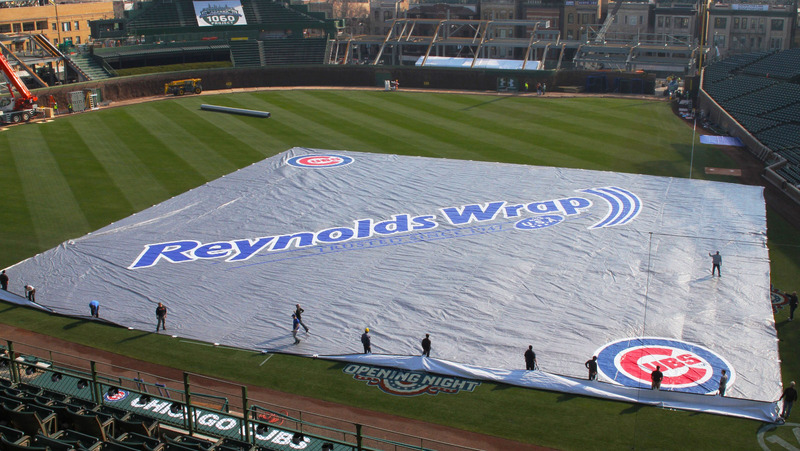 Once the idea was there, the Reynolds internal creative team drafted designs for the tarp, and the Cubs eventually worked with their own supplier to bring it to life. "I think the end product creates a lot of talk value," Green said. "Certainly for the partner to have 2 million views on Reddit just shows what you can do when you're able to push the bounds of creativity."